First, a follow-up from last week's diary. 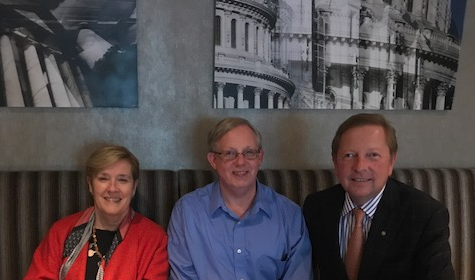 Following the 2017 United States Mint Numismatic Forum at the Mint headquarters in Washington, D.C., I met Tom Uram for a happy hour beverage with Citizen's Coinage Advisory Committee chair Mary Lannin. Tom asked our server to take the photo. 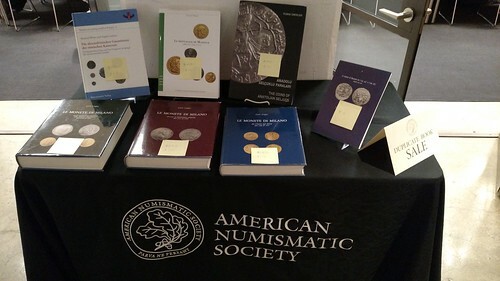 We had a great casual conversation on topics including the upcoming Pennsylvania Association of Numismatists (PAN) show, personal travel, coins with dogs, The E-Sylum, and of course, the day's events at the forum. It was a great way to relax before hitting the rush hour traffic for my ride home. Last Friday morning I hit the road again, this time pointing my car toward New York City. My wife and two of our three children were aboard for the ride. While I would be spending Saturday afternoon at the American Numismatic Society forum on The Future of Digitization, they would be seeing the sights of the city, to include a trip to the Statue of Liberty. The weekend weather was marvelous. While they walked down to Battery Park from our Tribeca hotel after breakfast Saturday morning, I was taking in the indoor sights at the ANS. Here are some of my photos. 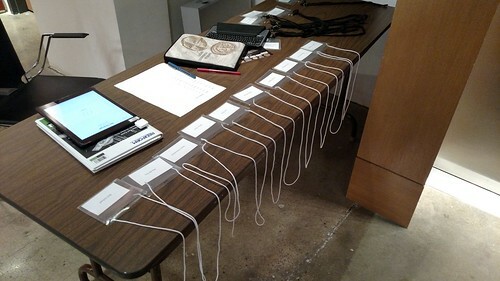 After checking in with security in the building lobby and at the guard station at the entrance to ANS spaces on the 11th floor, I met ANS Membership Assistant Emma Pratt, who was manning the registration desk. I got my badge, paid my fee and also picked up a book from the library's duplicate sale. Had I snapped a Before photo I could ask, "Which one is missing?" after making my own purchase. 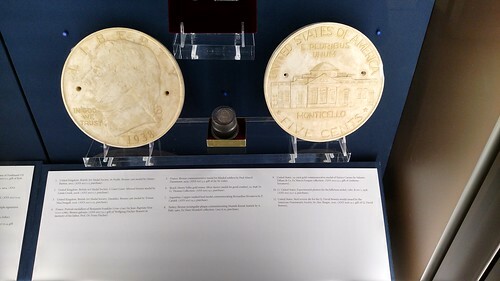 The exhibits held some amazing material, including this proposed design for the Jefferson Nickel. Librarian David Hill was open for business during the event. Here are shelves holding new purchases. Readers may recognize some titles we've discussed here recently - David noted that a number of these purchases followed announcements of new books in E-Sylum. 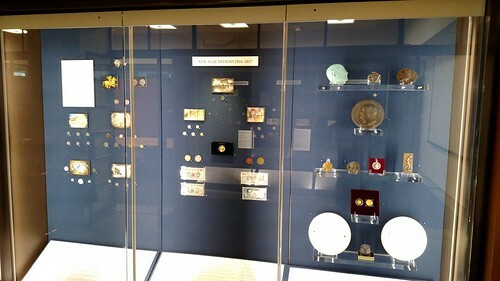 I was participating on behalf of the Newman Numismatic Portal, and joined the rest of our delegation for a library tour before the forum started. I took this shot in front of the library shelves. 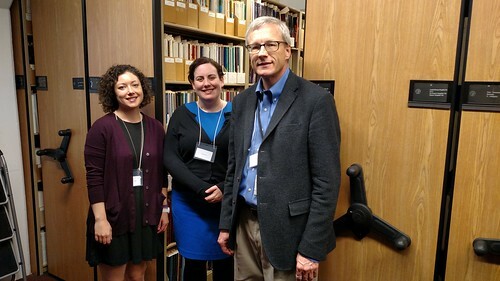 From left to right are Washington University in St. Louis employees Shannon Davis, Nicole Fry and Len Augsburger, the NNP Project Coordinator. 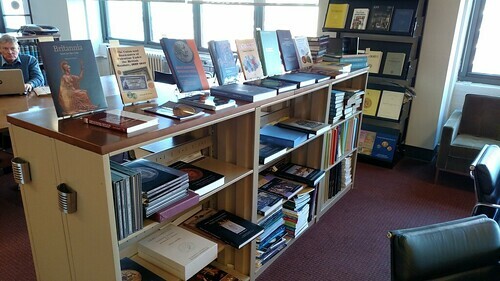 It was humbling to see the vast extent of just one numismatic library's holdings and realize that we've only barely scratched the surface of the space with the 1.6 million pages currently in NNP. I'm no professional photographer, and it shows. The lighting is horrible in this shot as David Hill began his talk. 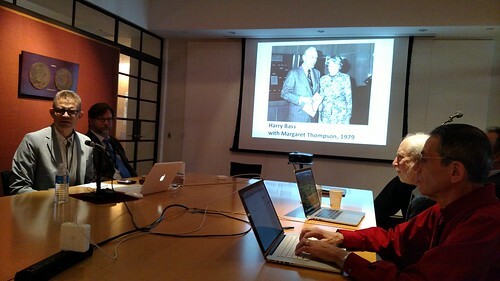 It focused on the history of digitization at the ANS, beginning with work sponsored by donor Harry Bass. I never met the Texas billionaire in person, but we were heavy email pen-pals. Here Publications Director Andrew Reinhard speaks with Executive Director Ute Wartenberg Kagan on the left. Here's a shot during one of the breaks. 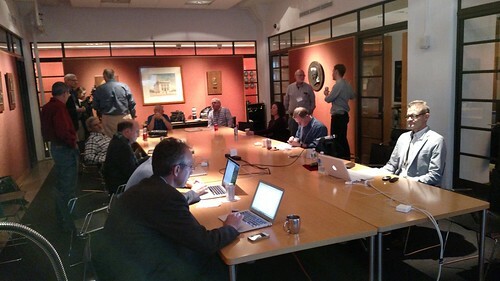 Participants included Victor England of Classical Numismatics Group, ANS Greek Coins Curator Peter van Alfen, David Bailey, Jim Neiswinter, Matthew Ruttley, Eric Krauss and Jay Galst. Victor and I planned to exchange URLs of useful web sites for numismatic research. 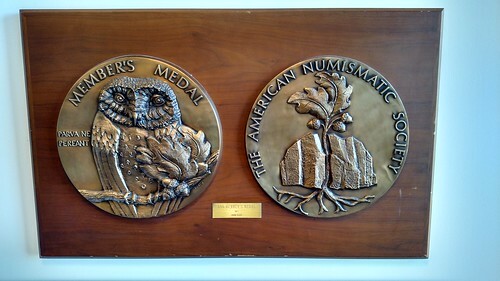 Several people I met for the first time including Dave Bailey, who has a numismatic photo collection he may share on NNP, and who will help me reach out to the Garden State Numismatic Society in New Jersey about digitizing their back journals. I learned that like myself Matthew works as a Data Scientist and we shared some ideas for future NNP features. The conversations on the breaks and at the wine reception afterward were quite enjoyable. 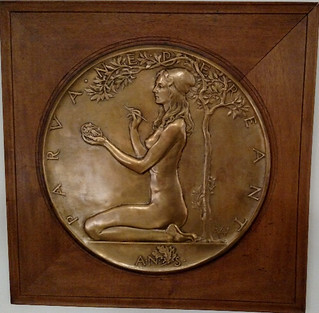 Here are a couple more photos from the ANS offices. Afterwards I walked back to my hotel with Nicole, who was also staying at the Hilton Garden Inn. My family and I crowded into a cab which took us uptown to a favorite Italian restaurant. From there we walked over to Times Square and enjoyed the sights and sounds (but not the crowds), picking up some souvenirs and clothing. Another taxi took us back to Tribeca where we met Len Augsburger in the hotel lobby. Len and I retreated to the hotel restaurant for an enjoyable two-hour meeting over drinks on the sidewalk patio. 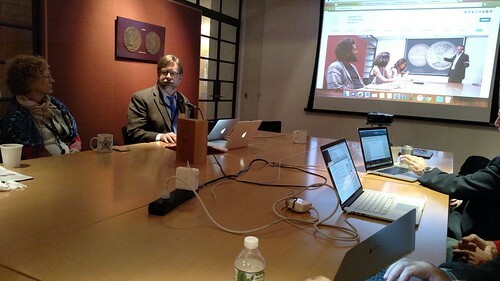 We discussed all the day's events, and current and future plans for the Newman Numismatic Portal. 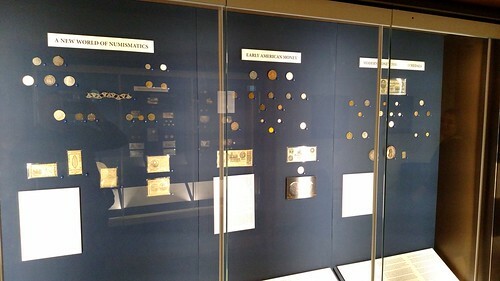 That was it for the numismatic part of my trip. The next morning my family and I wandered around Tribeca, Soho and Greenwich Village, having breakfast and enjoying the sights of New York. Around 11am we picked up my car and headed through the Holland Tunnel toward Virginia. After arriving home we unpacked and split up for dinner - I stayed home with the menfolk and ordered takeout to watch our hometown football team play. After the Steelers wrapped up a win I worked to finish The E-Sylum before calling it a day. For those who missed the event, follow the ANS YouTube channel for the videos. Some of the talks have already been posted, so follow the links below.